Using Yuasa 5C collet indexers and rotary tables, MASON MACHINE & TOOL has the ability to machine parts that require 4th axis milling. 4th axis machining allows us to rotate a part on a mill, and machine at any degree around the circumference of the part. Thus, multiple surfaces can be machined in a single setup. This increases our versatility by allowing us to make more difficult parts and reduce set-up time. The result is cost savings that can be shared with our customers. 4th axis milling is ideal for machining components that require close tolerances. A single setup can be used to machine features in many different part orientations. Eliminating the need to reload a part creates fewer opportunities for error, which leads to greater consistency and precision. Our rotary table accuracy is within 80 seconds of arc, and our indexer accuracy is within 30 seconds of arc. 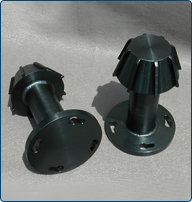 If you need a company to machine prototype or short run parts that require 4th axis milling, give MASON MACHINE & TOOL a call. We’d like to show you the quality of our work.